Gymnastics is not only a fantastic sport in its own right, it also gives an exceptional base level of coordination, skill and confidence that assists children achieve in all their other sports and life skills. 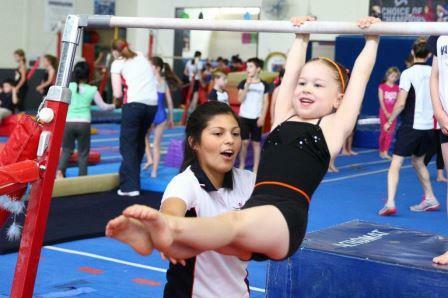 We offer weekly gymnastics classes full of fun and learning for school children aged 5-14 years. Both beginners as well as children with prior gymnastics experience are very welcome! We have outstanding venues, quality equipment and exceptional coaching staff. We offer classes at five fantastic locations and are currently taking bookings. For more information on our Educational Gymnastics program, please click here. For information about a specific venue, including class times, please click below on the venue that interests you, or contact our office on 9887-9611 or email us. Our magnificent permanently set up Mt Waverley facilities include in-ground Trampolines, huge Foam pits, eleven Beams, eight Bars, five Bungees, a 15m Tumble trak, full size Sprung Floor and much more. We pride ourselves on keeping up with the latest innovations in gymnastics equipment and teaching aids. Located in residential Mt Waverley, our venue is one of the best in Australia. All classes are full of fun and learning and are taken by our exceptional, experienced and qualified coaches. To find out more about gymnastics classes at our Mt Waverley campus, please feel free to contact our friendly office on 9887-9611 or email us. 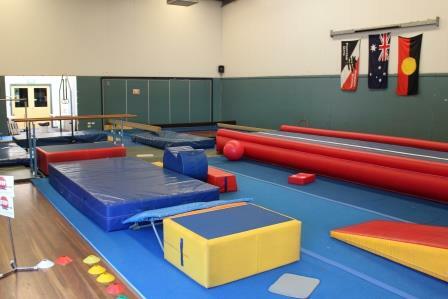 Our extensive Armadale gymnastics facilities are located at the prestigious Lauriston Girls School. The gymnastics facilities include the exciting 20-foot inflatable tumble air trampoline (which is an exceptional learning tool for safely teaching tumbling and jumping gymnastics skills), a double mini trampoline, 3 beams, 2 sets of bars, rings set, rope track, 4 gymnastics floor strips, 6 gymnastics crash mats, and a wide variety of gymnastics shapes and teaching aids. We pride ourselves on keeping up with the latest innovations in gymnastics teaching aids. All classes are full of fun and learning and are taken by our exceptional, experienced and qualified coaches. To find out more about gymnastics classes at our Armadale campus, please feel free to contact our friendly office on 9887-9611 or email us. 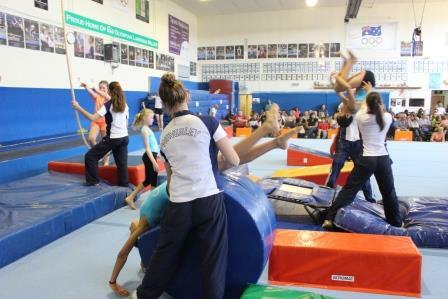 Our impressive permanently set up Glen Waverley gymnastics facilities are located at the prestigious Wesley College. Our facilities include the exciting 20 foot inflatable tumble air trampoline (which is an exceptional learning tool for safely teaching tumbling and jumping gymnastics skills), 3 Beams, 3 Bars, 2 sets of Rings, Rope track, Parallel Bars, 3 gymnastics floor strips and a wide variety of gymnastics shapes and teaching aids. We pride ourselves on keeping up with the latest innovations in gymnastics teaching aids. All classes are full of fun and learning and are taken by our exceptional, experienced and qualified coaches. To find out more about gymnastics classes at our Glen Waverley campus, please feel free to contact our friendly office on 9887-9611 or email us. 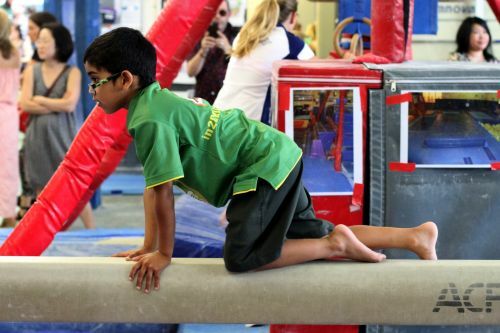 Our exciting Narre Warren gymnastics facilities are held at the popular Fountain Gate Primary School, located in the City of Casey. The gymnastics facilities include a Mini Trampoline, 4 Beams, Parallel Bars, Rings set, 2 gymnastics floor strips, 4 gymnastics crash mats, and a wide variety of gymnastics shapes and teaching aids. We pride ourselves on keeping up with the latest innovations in gymnastics teaching aids. All classes are full of fun and learning and are taken by our exceptional, experienced and qualified coaches. To find out more about gymnastics classes at our Narre Warren campus, please feel free to contact our friendly office on 9887-9611 or email us. 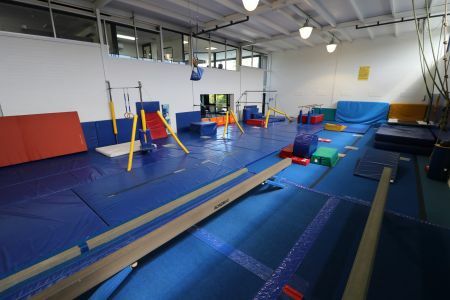 Our fabulous permanently set up Toorak gymnastics facilities are located at the prestigious St Catherine’s School. We have a full range of gymnastics equipment which is utilised in our progressive and fun-filled classes. 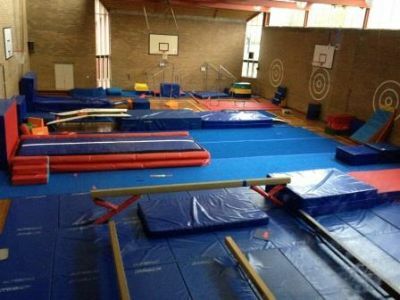 Circuits are set up covering floor, vault, bars, beam and trampoline, teaching gymnastics skills such as cartwheels, somersaults and handstands. We pride ourselves on keeping up with the latest innovations in gymnastics teaching aids. All classes are full of fun and learning and are taken by our exceptional, experienced and qualified coaches. To find out more about gymnastics classes at our Toorak campus, please feel free to contact our friendly office on 9887-9611 or email us.